Relax with family and friends on this comfortable and stylish sofa. Both rustic and traditional in design, this stationary sofa features rolled arms, bun wood legs, and decorative accent pillows with fringe welts. 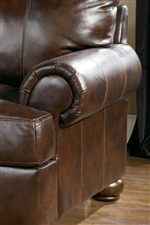 It sleek leather upholstery combined with 1.8 density foam creates the perfect combination of cushion and support - just what you need for long-term lounging and socializing. With room enough for 3 people, this sofa is the perfect centerpiece for your family room or entertainment area. 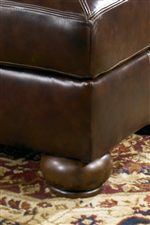 The Axiom - Walnut Traditional Stationary Sofa with Bun Wood Feet by Signature Design by Ashley at Walker's Furniture in the Spokane, Kennewick, Tri-Cities, Wenatchee, Coeur D’Alene, Yakima, Walla Walla, Umatilla, Moses Lake area. Product availability may vary. Contact us for the most current availability on this product.